Are you convinced that you know already everything about the Hot Spot in the Alps? Then pimp up your expert knowhow with fantastic news about the forthcoming 2017/2018 season. Discover true secrets which are still not revealed by Google at first sight. 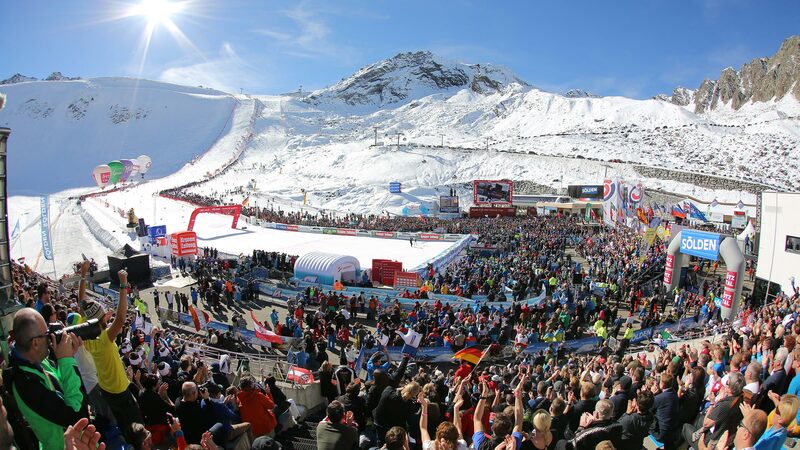 On occasion of the Alpine Ski World Cup Opening held at Rettenbach Glacier, the entire skiing elite gets together in Sölden, among them Olympic gold medal winners and Ski World Cup leaders. What’s best, also four local heroes have celebrated international wins and success. Bernhard Gstrein was an Olympic Silver Medal winner some 30 years ago. Before that, Andrè Arnold was a star of the American Pro Race Series where he won the title four times in a row and was awarded “Skier of the Year”. 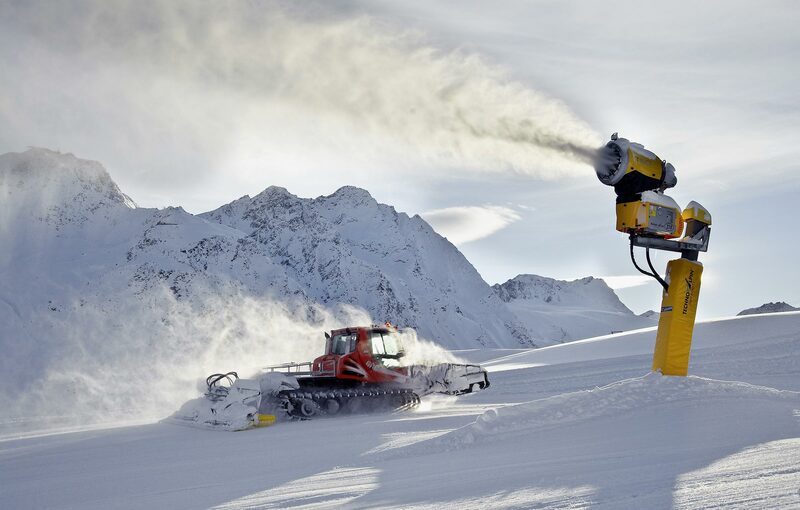 The chairman of Ski Club Sölden, Sigi Grüner, and his team mate Christoph Brugger are true “powder skiing kings” – they won the Powder Snow Skiing Champion title five times. Opening event of the European Football Championship in Paris, gigs at the legendary Pacha in Ibiza or performances in huge arenas: France’s star DJ David Guetta loves exceptional locations but he was enchanted by the ELECTRIC MOUNTAIN FESTIVAL première event on Rettenbach Glacier at 2700 m above sea level – with some 8000 cheering fans in the open-air arena: beat in boots plus driving snow! 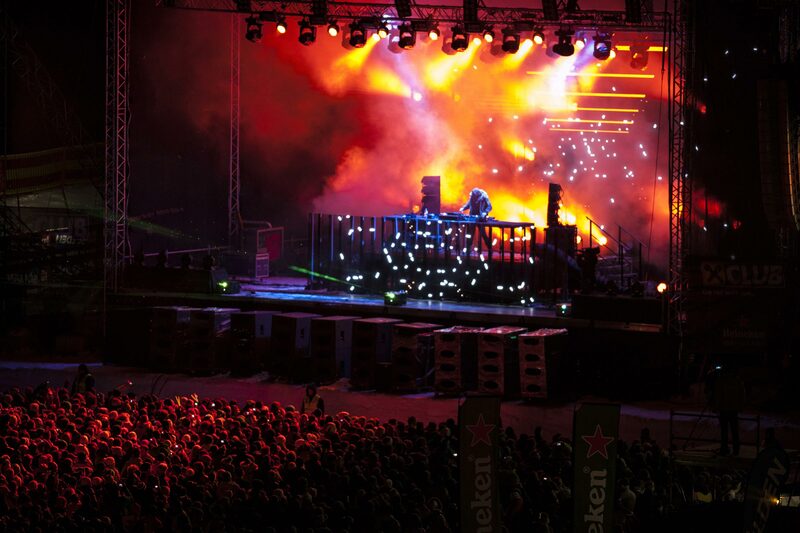 The festival moved to Giggijoch’s Funzone, presenting unrivaled stars of the scene on the turntables like NERVO, AFROJACK, Robin Schulz, Martin Solveig and many more. 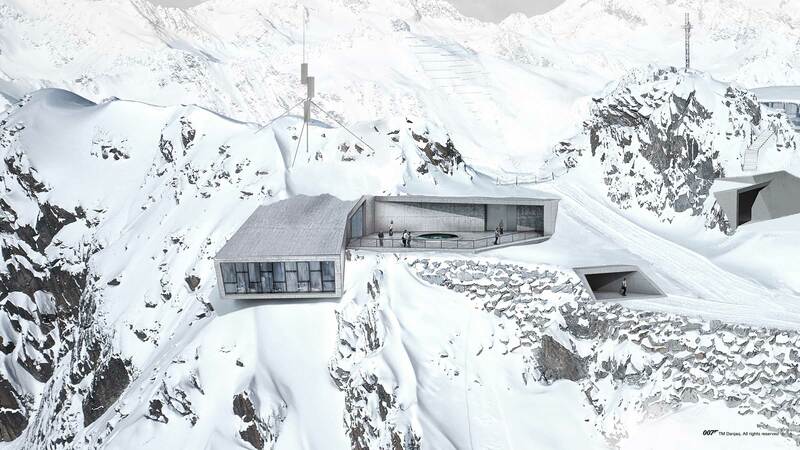 Not a unique performance but a long-standing relationship between Sölden, one of the action scene shooting locations of the latest James Bond movie “Spectre”, and her Majesty’s Secret Service: the peak of Gaislachkogl at 3048 meters above sea level will host an unrivaled Cinematic Installation from the coming winter season (2017/2018) onwards – 007 ELEMENTS covers incredible 1300 m² dedicated to the exciting world of James Bond. The exhibition focuses on “Spectre” and leading actor Daniel Craig in the role of the stunning MI5 pro but also impressions and highlights of other Bond Movies will be displayed. 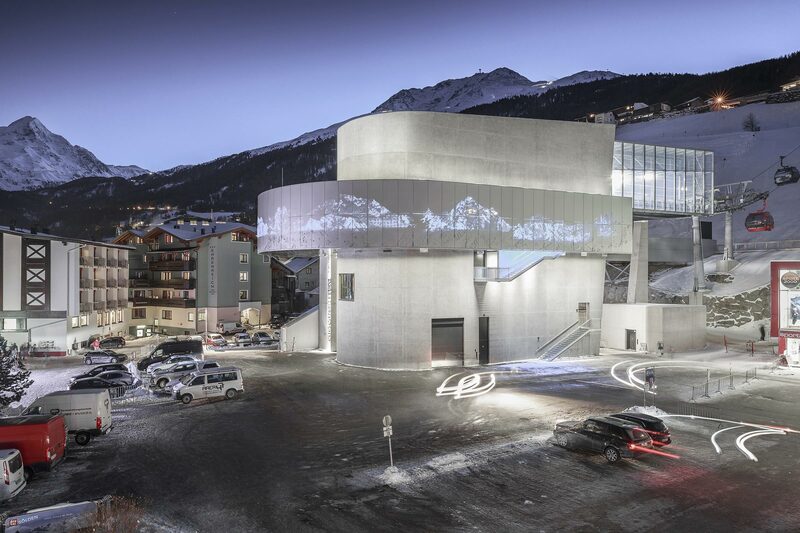 The building’s eye-catching elements are a masterpiece of Tirol’s architectural office Obermoser that also designed the Gaislachkogl mountain gondola and the ice Q gourmet restaurant. Technical attractions are guaranteed thanks to the pros of Optimist Inc. from Los Angeles, they have been collaborating with internet giants like Google or Facebook and were also responsible for the Grammy presentation of the cult band Daft Punk. Where can you find the two most powerful feeder gondolas world-wide? There is only one right answer: Sölden has it all – Gaislachkogl mountain gondola (built in 2010) and Giggijoch mountain gondola (built in 2016) have a total hourly capacity of up to 8100 people! The quickest and most comfy way to reach the giant ski area, complete with deluxe escalators. Climbing stairs in ski boots is definitely a thing of the past. What’s more, the cabins of the new Giggijoch gondola enter the top station in a single row, reminding of an underground terminal. Sometimes special wishes come true before Christmas. From the 2017/2018 winter season onwards (starting in mid-November), winter sport aficionados who purchase a 3+ day skipass can look forward to a joint lift ticket valid in Sölden and Obergurgl-Hochgurgl without any restrictions. The new Pow(d)er Card gives access to incredible 55 mountain lifts, 254 immaculate slope kilometers and 46 quaint ski huts. Passionate Sölden fans enjoy a picture-book view from the Top Mountain Star at 3000 m above sea level or a visit to Europe’s highest Motorcycle Museum in Hochgurgl. Regular guests in the rear valley head for Sölden and the ultimate BIG 3 Rally, the glacier ski mountains and the James Bond movie shooting locations. Knife-edge victories are the order of the day when it comes to professional sports, as well as ex aequo rankings. 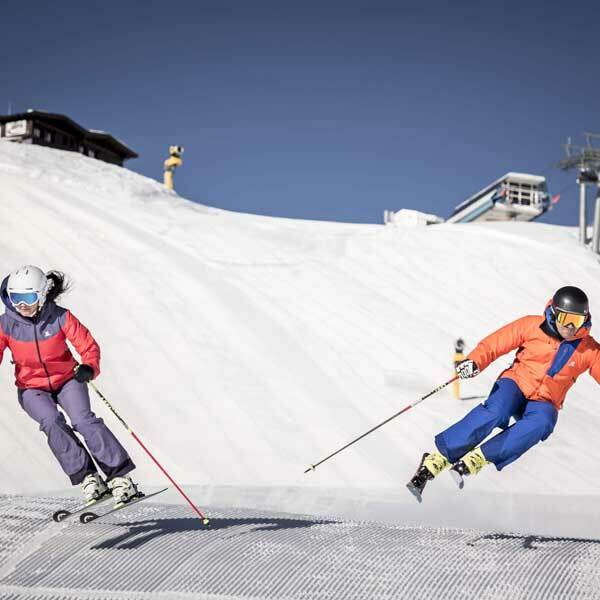 But one legendary women’s Alpine Ski Season Opening went down in the history books: Andrine Flemmen (NOR), Nicole Hosp (AUT) and Tina Maze (SLO) won the Slalom Race on Rettenbach Glacier in 2002 – their exact time was 1:49.91 minutes. A triple win that has never been reached before or after. Paris, Helsinki, Moscow or Munich? Great places for couples and lovelocks! But all these locations are easy to top – welcome to Ötztal’s most romantic love heaven at 3250 meters above sea level. 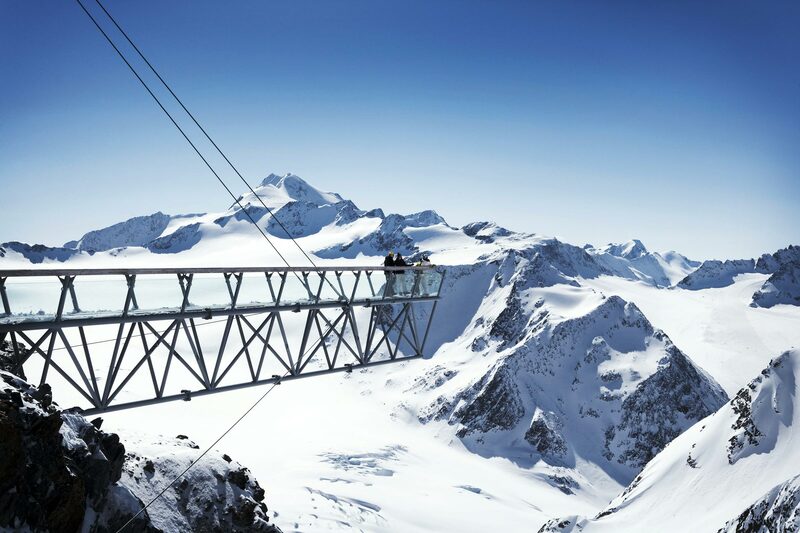 Additionally, you indulge in uninterrupted views of Wildspitze peak – North Tirol’s highest mountain as lovely backdrop. This magic place can be found at Tiefenbachkogl summit equipped with a 20-meter long footpath made of glass. Easily accessible by mountain gondola. Perfectly groomed ski slopes, state-of-the-art equipment, safe snow conditions and culinary rest stops are an absolute must. A whole crowd of busy workers takes care of the entire ski area day after day. 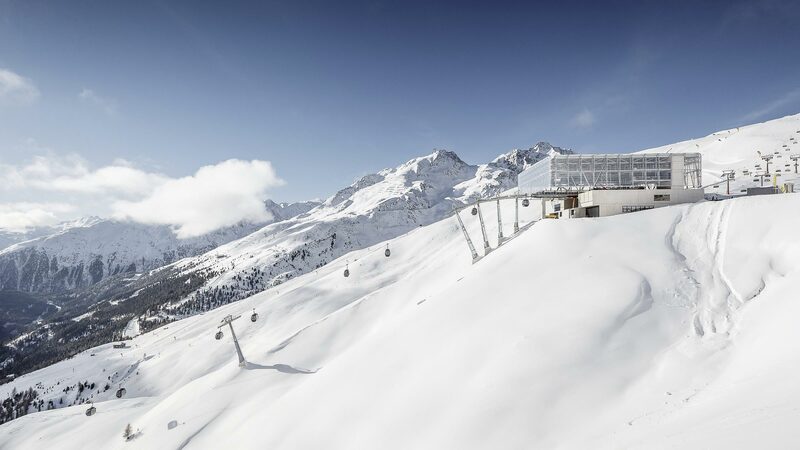 Bergbahnen Sölden Mountain Lift Company has up to 500 employees in winter, among them lift staff, slope rescue teams, gastronomy experts or professional slope groomers. They do an excellent job, even during the night when the slope grooming team sets out to prepare the nearly immaculate ski runs for the next morning. 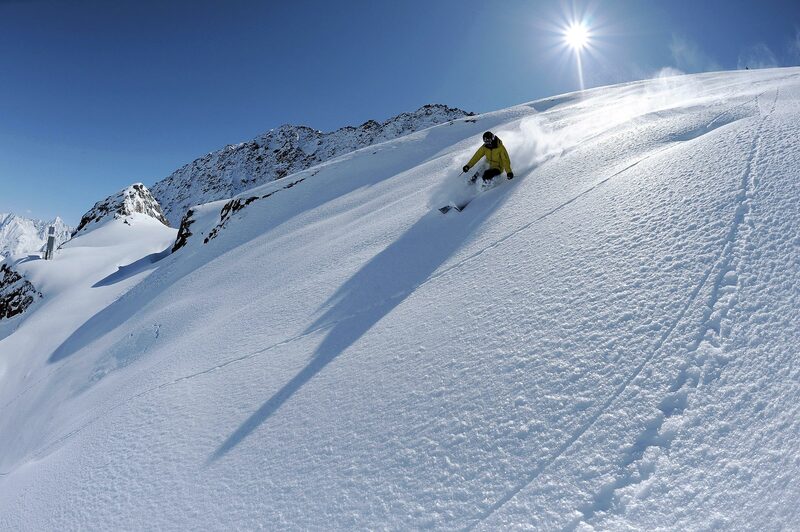 Sölden beats other places of interest by far when it comes to the “best skiing place”. 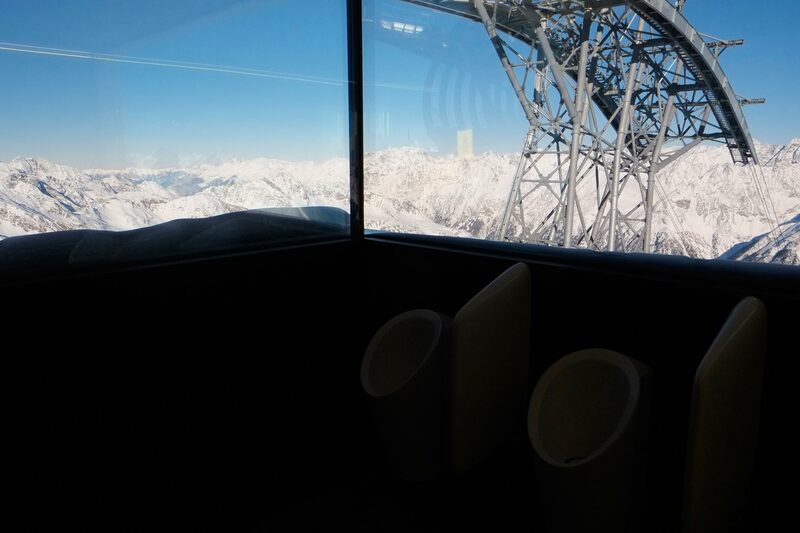 But there is another, lesser known category: Ötztal’s winter sport metropolis also offers the “best loo view”! Simply come and see for yourself, the men’s lavatory of the Powder Q at 3048 meters above sea level is really unbeatable and ranks among the undisputed highlights not to be missed if you are on holidays in Sölden. One more attraction is waiting for winter guests: the recently opened Restaurant at Rettenbach Glacier. Back in 1976, a big ski hut was built in rustic style. 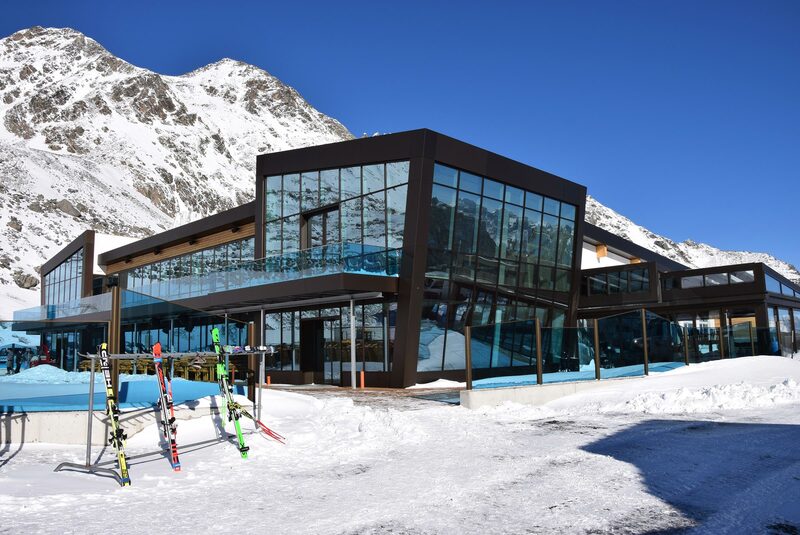 Today, the top modern restaurant features many eye-catching glass elements in a superb location – just perfect for hungry and thirsty skiers looking for a well-deserved rest stop. The choice is varied: there is a spacious self-service restaurant and a comfy restaurant with table service (“Gletschertisch”) overlooking the stunning Alpine scenery and the World Cup Ski Slope. Party fans meet at the “Gletscherspalte” bar with movable roof and walls which can be folded away in nice weather. In addition, a new ski ramp towards the valley (piste no. 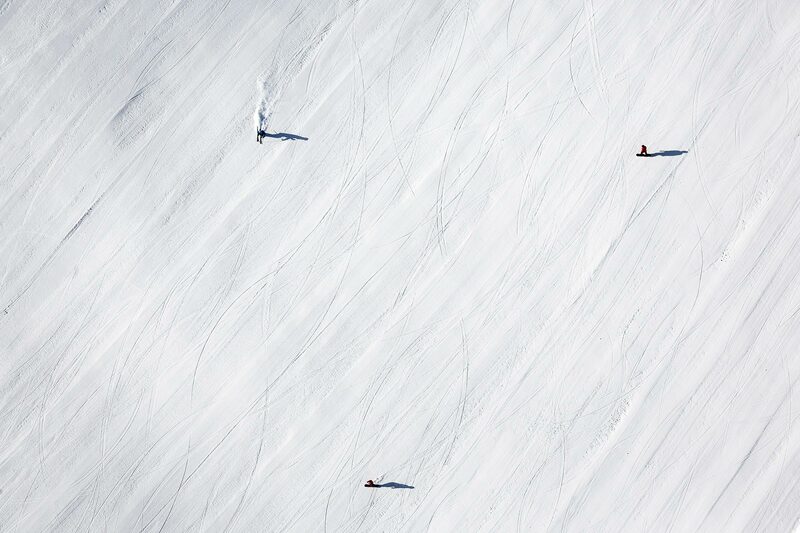 30) promises a more comfy access to the longest top-to-bottom ski run.